This graduation season, local pizza restaurants are partnering with the Lincoln County Drug-Free Coalition and Law Enforcement to promote the Parents Who Host Lose the Most: Don’t Be a Party to Underage Drinking Campaign. The goal of the campaign is to educate the community about the health risks of underage drinking and the legal outcomes of providing alcohol to youth. Graduation is an important milestone in young people’s lives and cause for celebration; however it’s important for parents to remember that providing alcohol to teens at graduation parties can be costly for everyone involved. It is illegal, unsafe, and unhealthy for anyone under age 21 to drink alcohol. Breaking the law by purchasing alcohol, or hosting a teen drinking party, can result in fines up to $500 per underage person to whom alcohol is provided. The following pizza establishments are supporting the Parents Who Host Lose the Most: Don’t Be a Party to Underage Drinking Campaign by placing stickers on carry out pizza boxes/containers and posting posters within their restaurant. Several simple steps can be taken to prevent underage alcohol use at graduation parties: (1) Host safe, alcohol-free activities and events for youth during graduation season and the summer. (2) Refuse to supply alcohol to children or allow drinking in your home or on your property(s). (3) Be at home when your teenager has a party. (4) Make sure your teenager’s friends do not bring alcohol into your home. If youth bring in alcohol, take it away immediately. (5) Talk to other parents about alcohol-free youth events. (6) Report underage drinking to authorities promptly. The mission of the Lincoln County Drug Free Coalition is to work with the community to reduce the use/abuse of alcohol, tobacco and other drugs among youth and over time among adults. The coalition, along with Law Enforcement and other partners of Healthy People Lincoln County, are working together to make our community a healthier and safer place to live for Lincoln County residents. 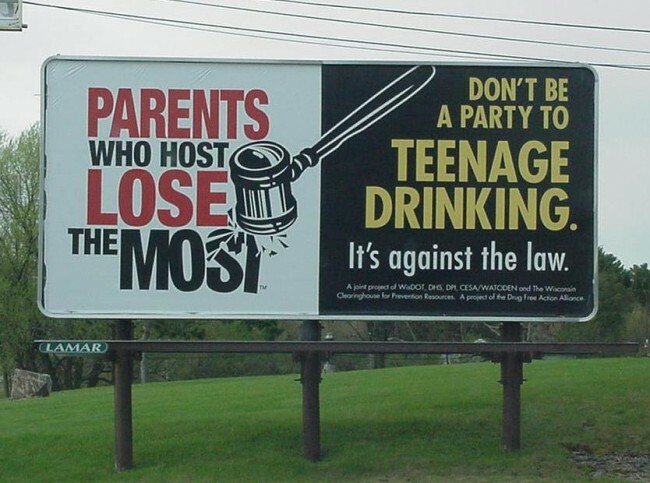 Parents Who Host, Lose the Most: Don’t be a Party to Teenage Drinking Campaign was developed by and is a project of Drug-Free Action Alliance. If you would like more information, please contact Kristin Bath, Lincoln County Health Department, at 715-539-1373 or Debbie Moellendorf, Lincoln County UW-Extension, at 715-539-1077. Parents Who Host, Lose the Most: Don’t be a party to teenage drinking was developed by and is a project of Drug-Free Action Alliance.